How narrowing your niche is a key element to attracting MORE students and earning more money. How to get a steady stream of new students via referrals from other teachers in your area (it's easier than you think). Why actually rejecting 'some' types of students will help you attract higher quality guitar students. How to expand on your current guitar teaching model to help your guitar students learn faster and more effectively (while helping you earn more money). Easy ways to get bigger results for your students and how this will translate into more money for you. 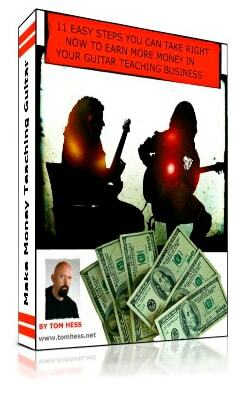 Get all of this now so that you can begin today to earn more money teaching guitar and help your students become better guitar players faster. Simply enter your name and email, then click the "Give Me Access Now" button to enter. All of your information is always kept 100% private and confidential.